This year, Kinder have taken their ever-renowned children’s toys to the next level with the Teen Idols range – a collection of 16 of the world’s most influential icons throughout history, sport and pop culture. Inside each tasty Kinder Joy egg you’ll find a figurine of a world famous icon, an icon card with two stickers, or an accessory with the theme of this superstar. And, it goes without saying that these exciting new Kinder toys come as surprise gifts inside the delicious creamy white and milk chocolate Kinder eggs that we all know and love. Probably one of the most recognisable faces in world football today, and indeed ever, Cristiano has gone from strength to strength throughout his career at Sporting Lisbon, Manchester United and Real Madrid. As the captain and record goal scorer of the current European champions Portugal, Ronaldo really is stamping his claim as one of the greatest footballers of all time. A perfect gift for boys, Cristiano is sure to be a hit with any football fan out there and could be hiding in any of the Kinder Joy eggs, just waiting for his new teammate. An inspiration for girls everywhere, Serena Williams has won more Grand Slam tournaments than any tennis player in the open era! She’s been a superstar for almost two decades and doesn’t show any signs of slowing down. Her unrivalled desire to win means she’s never far from a tennis court, so help Serena out and find her inside one of these delicious Kinder chocolate eggs. The Norwegian DJ took the charts by storm with this hits ‘Stole the Show’, ‘Here for You’ and ‘Stay’, and these songs having been living in our head ever since. But now Kygo is living inside some of our delicious Kinder egg chocolate, just waiting to be found! There’s one thing we do know though – he’ll be waiting to spring out of the starting blocks when you open up a Kinder Joy Teen Idols egg. The pop princess with the punk attitude has been around for a while now but shows no signs of slowing down. She’s had massive success with ‘Sk8er Boi’, ‘Complicated’ and ‘Girlfriend’, making her the pin-up bad girl for the generation. You’ll be able to plaster your stickers or cards across your room, or proudly display your Avril figure, if you find her inside your Kinder Joy egg. Beethoven is a household name after composing some of the most iconic pieces of music in history, and has staked his claim as arguably the most successful musicians of all time. His music is still widely listened to today, and while he hasn’t released anything in around 200 years, you might still find him hanging around inside a Kinder Joy Teen Idol egg. The Canadian singer and songwriter has tasted success with her hit singles ‘Scars to Your Beautiful’ and ‘Stay’. A guaranteed favourite on anyone’s playlist, Alessia is the star of the moment and is the perfect surprise for anyone tucking into a delicious chocolate Kinder Egg. Developed of the theory of relativity, Albert Einstein is universally known for his contributions to science throughout history. Einstein is often thought of as the smartest man who ever lived, so why not be smart and find yourself a figurine, an accessory or a trading card and some stickers of the world-famous physicist inside one of these chocolate eggs? Lewis is one of the UK’s national sporting treasures, and has long been seen that way ever since his first Formula One Championship win back in 2008. The driver has gone from strength to strength to become one of the most recognisable names and faces in the sport today. That’s why you’ll be sure to recognise your own Lewis Hamilton Kinder toy – whether you’re the lucky winner of a figure, a trading card and some stickers or the personalised Lewis Hamilton accessory. Famous for discovering the Americas, Christopher Columbus wrote himself into history with his exploration exploits. Yet he’s somehow found himself lost inside a Kinder Joy egg, so help Christopher out and find him in one of our delicious chocolate eggs. The Australian singer is set to take the world by storm over the next few years and has already collaborated with big names in the music industry, such as Flo Rida and Ziggy Marley. Why not get ahead of the trend and find yourself a Cody Simpson Kinder Egg Surprise? Known around the world, the popstar and judge of the hit TV show The Voice has a face and a voice that’s hard to miss. Meaning girls and boys alike will be delighted to find Jessie hiding inside one of their Kinder eggs. Star of the US Ski Team, Lindsey Vonn has won four World Cup championships and became the first US woman to win a gold medal in the downhill event at the 2010 Winter Olympics. Still going strong today, Lindsey is the face of US skiing and could be the surprise face hiding inside your Kinder Joy chocolate egg. The singer-songwriter came to fame after being discovered on YouTube, and she’s waiting to be discovered by you inside a Kinder Joy Teen Idol egg! Often referred to as a polymath, Da Vinci has become one of history’s most important names in the fields of architecture, maths, literature and painting. Want to know what he’s been up to since the sixteenth century? Why not ask your Leonardo Da Vinci figure, trading card and stickers or accessory when you open up a Kinder Joy egg and find him? The restauranteur, author and television personality is all over our screens these days, offering his expert option on just about everything food. 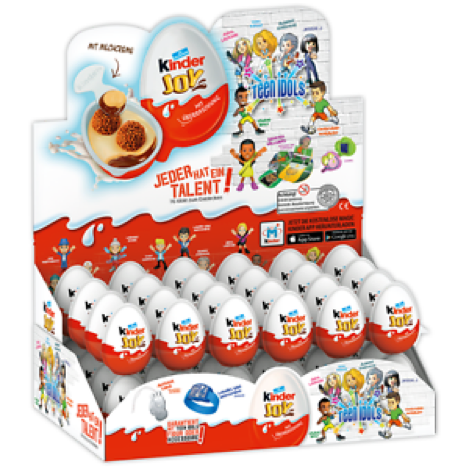 A former host of Masterchef, he’s proven he’s still got great taste by picking these Kinder Joy eggs to hide out in. Just eat away the tasty, creamy chocolate to find Joe waiting for you, as a card and two stickers, as a personalised accessory or as a cool toy figure for girls or boys. 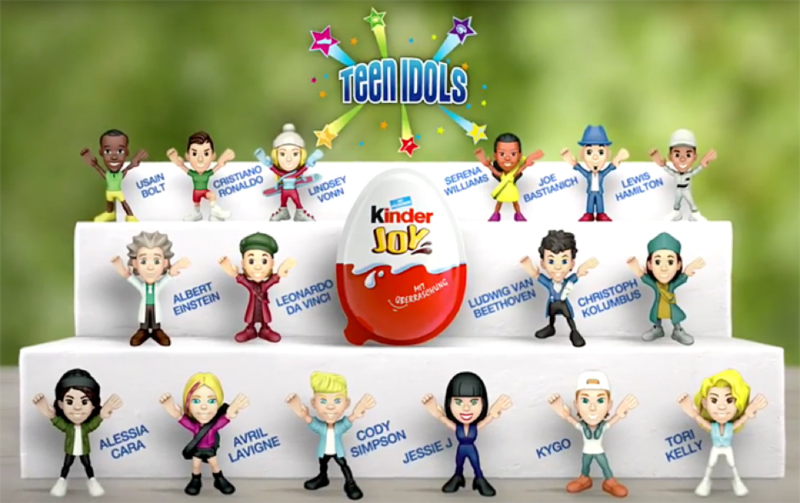 So there you have it, that’s the exciting line-up that’s on offer inside Kinder Joy Teen Idols Eggs! Why not be the talk of the playground and collect the whole set of idols? At KinderSupriseWorld.com, we couldn’t be more excited to stock each and every one of these global megastars in our ever extensive range.